One of the problems in this business is picking the few relevant pieces of information out of the endless stream of financial news, opinion and speculation. Like a prospectors looking for a slightly shinier flake of stone among the silt in our pans we occasionally pick out promising pieces we think have not gotten enough love. Janet Yellen’s speech last Friday was covered, but I think it deserves more attention. Yellen reviewed the monetary policy over the 2014-2016 period with the benefit of hindsight. The turning point for the fed came in 2014 when it judged that the economy was on a self-sustaining course. This, of course, lead to the gradual end of new securities purchases under QE (“the Taper”) and was anticipated by the fed to lead to more rapid increases in the fed funds rate than actually transpired over 2015-16. Why did the fed not raise rates as quickly as they had thought they would? Mainly because of surprise weakness overseas and the strength in the dollar. 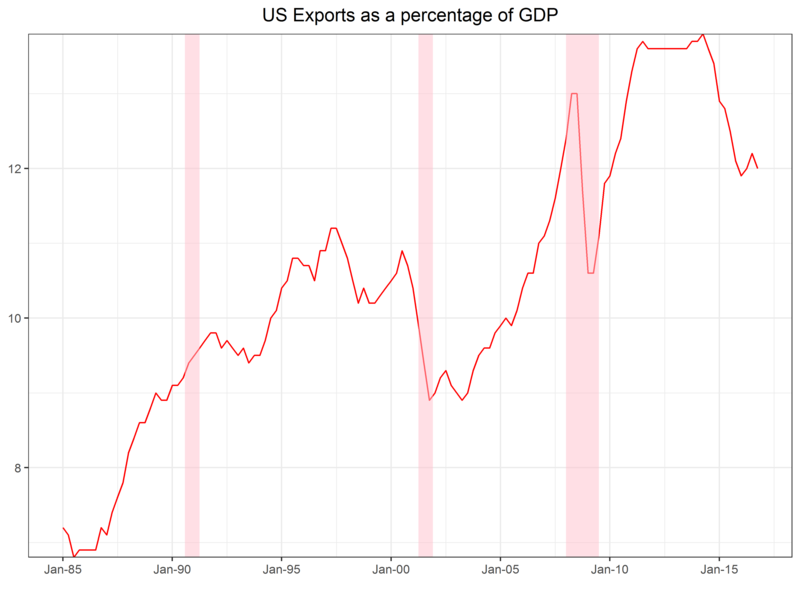 These combined to cut exports by about 2% of GDP over 2015 and the new, lower level of exports has been sustained since. Additionally, the decline in energy prices leading to lower capital expenditure. The rise in the dollar and fall in energy prices also slowed inflation, giving the FOMC another reason to delay. 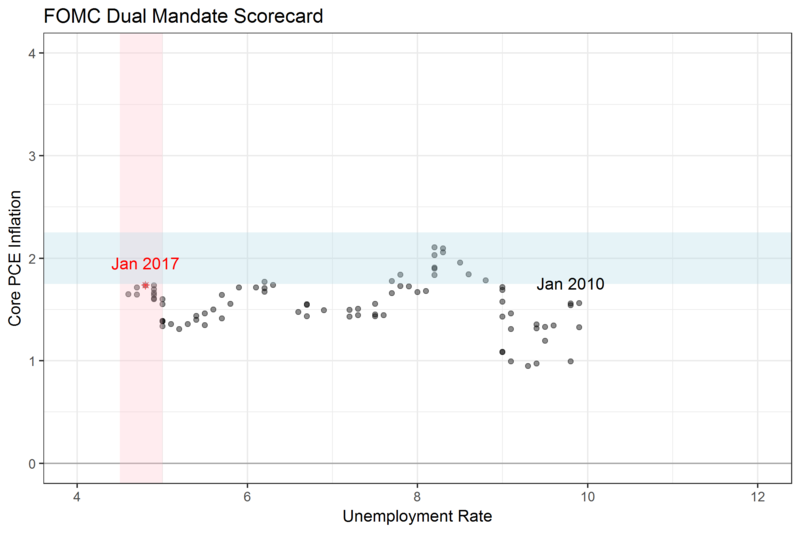 I have my own FOMC scorecard I like to use which graphs the Fed against its dual mandate of full employment and price stability. This chart emphasizes the good job they have done since the global financial crisis to set rates such that the labor market has made consistent progress toward full employment (the pink area in the chart) but maintaining price stability. In fact, the Fed has been below its inflation goal of about 2% over that period (the blue area in the chart). Based on this chart there was no compelling reason for the Fed to risk aggressive hikes over the last few years. As a way of thinking about where rates may normalize, Yellen puts this review in the useful context of the neutral real rate. That is the real (inflation adjusted) interest rate which neither accelerates nor decelerates inflation. The Fed’s current estimate of the neutral real rate is about zero, meaning fed funds at around the inflation trend. Core PCE, the Fed’s preferred measure of inflation, has averaged about 1.6% since 2014. Putting the pieces together, with fed funds at 0.75%, the Fed can easily be at neutral rate of about 1.6% by the end of the year at a stately pace. Where does the Fed see rates longer term? Given how subdued inflation has been in the context of a fairly robust job market in the 2014-16 period FOMC members have reduced their estimates of the longer run neutral rate. Specifically the median committee member has reduced their estimate of the long run (greater than 3 years) neutral fed funds rate from about 1 3/4% to about 1%. The logic is: given that labor market has been close to its potential, inflation should have been increasing in the US if we had been close to the neutral rate. Though the Chair does say she expects that estimate of long run neutral real rate to increase in the future. It is important to recall that the Fed has said it will begin to reduce the size of its balance sheet once it has normalized real rates. Rates will arguably be normalized when they are about 1.5% or three 0.25% hikes from now. As such, I look for discussions about the Fed ceasing to reinvest the principal and interest payments from its bloated balance sheet as rates creep toward that level. Funds increasing toward neutral real rate (currently estimated at about 1.5-2%) in the next year. As that is accomplished the Fed to discuss allowing the balance sheet to shrink. Further hikes of about 1% over the following few years. All this assumes that the economy behaves as expected. A recession would stall or reverse tightening, a sustained inflationary spike would accelerate it. It also assumes that the new administration’s appointees to the FOMC share the same basic framework as current members. As always we will continue to monitor the Federal Reserve closely and update our clients as our analysis changes.